CARMEL, Ind. 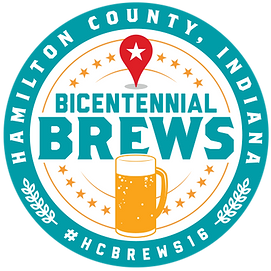 (Jan. 7, 2016) -- The BrewsLine, a Hamilton County beer tour operator, has announced it will offer Bicentennial Brew tours every Sunday beginning Jan. 10 and ending May 22. The tours will take people to five craft breweries in the Hamilton County cities of Carmel, Fishers, Noblesville and Westfield where they can sample beers named for or brewed with ingredients relevant to Hamilton County and Indiana history. Bicentennial Brew tour stops include Deer Creek Brewery, Deviate Brewing, Grand Junction Brewing Company, Heady Hollow Brewing Company and Sun King Fishers Tap Room. During the tours, brewery representatives will meet with guests and share backstories behind the beers. Grand Junction Brewing Company’s Squirrel Stampede Nut Brown Ale is one such historical brew. The beer was named for the fleet of migratory squirrels that destroyed crops across Hamilton County in the 1800s. The BrewsLine bus seats 12 people at maximum. Pickup locations include Brockway Pub at 12525 Old Meridian St. in Carmel; Scotty’s Brewhouse at 14741 Hazel Dell Crossing in Noblesville and Alleys Ale House at 13825 Britton Park Road in Fishers. Pickup location is determined upon booking the bus. Parties of 12 or more may request a custom pickup location. All tours begin at 12:30 p.m. and end around 4:30 p.m. The cost of participating in a Bicentennial Brew tour is $40 per person. People can make reservations at visithamiltoncounty.com/2016/. In addition to the Bicentennial Brew Tours, Indiana on Tap will host a series “Bicentennial Pours and Pints” events throughout the winter and spring months. The Bicentennial Pours and Pints events will be held at one brewery per month, beginning Jan. 14 at Deviate Brewing Company. The events will feature special deals, giveaways and pours of each brewery’s bicentennial-themed brew. Find the complete schedule at visithamiltoncounty.com/2016/bicentennial-brew-tour/. The BrewsLine is a local tour company that provides a safe, fun way for people to visit several local Hamilton County and Indianapolis craft breweries in one day. The BrewsLine works with the owners and operators of the local breweries to create the best experience possible. Learn more at www.brewsline.com. Indiana On Tap is the state&apos;s premier online destination for Indiana craft beer news, events and more. Through our breaking news and editorials, along with the state&apos;s largest brewery directory and social media community of craft beer fans, visitors will learn what Indiana craft beer is about so that they can better plan their next visit or beer purchase. After all, a smarter beer drinker is a better beer drinker! Learn more at www.IndianaOnTap.com. Hamilton County Tourism is a not-for-profit tourism economic development organization that promotes tourism growth through strategic marketing, hospitality and community development initiatives to provide hospitality to more than 3 million visitors who come to Hamilton County, Indiana each year. Learn more at www.visithamiltoncounty.com.